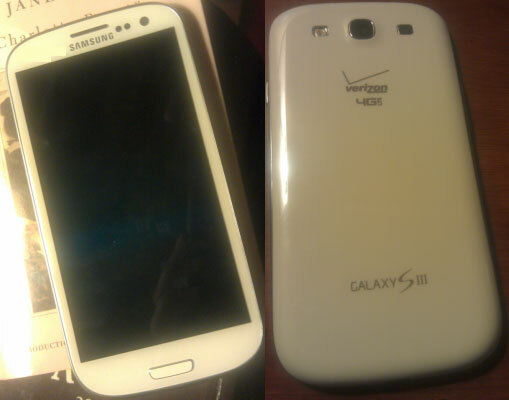 Verizon is one of the five carriers to start offering the Samsung Galaxy S III this month and leaked pictures show that the device will virtually be an untouched version of its international GSM sibling. Android Central got their hands on some photos of the Galaxy S III for the Big Red, which, excluding the 4G Verizon logo on the back, is the same as the GSM model of the device. The only difference is it runs on a dual-core 1.5GHz Qualcomm Snapdragon S4 MSM8960 chipset with 2GB of RAM. Samsung have decided not to alter the Galaxy S III as much as they did with the Galaxy S II lineup last year and launch the device with the same outfit as everywhere else. This seems to be the case with the US-bound T-Mobile version and the one sold by AT&T, as well. Speaking of launch, it's yet unclear when Verizon is going to put the Galaxy S III on the shelves, but it will surely be sometime this month. yes , 2GB of RAM, thats the same amount of ram i have in my pc.